This is the second year I've run the Oak Barrel Half Marathon in the quaint town of Lynchburg, Tennessee. Although this is an incredibly challenging run (spoiler alert), it is quickly becoming one of my favorite local races. Lynchburg is about an hour and a half south of Nashville, and it's size not only limits the size of the field (this race caps out at 1600 runners), but it also means you have to plan to arrive early. There is just one two lane road in and out of town, so you need to allow plenty of time to get in and parked. Because I worry (okay panic) about logistical details, that meant I was up at 3:45 to get ready and out the door. I arrived a little after 6 AM and had plenty of down time before the 8 AM race start. That gave me time to pick up my bib and super awesome half zip. Because it's such a small race, they are pretty intense about packet pickup; you cannot pick up someone else's bib and they do check for ID. The starting area is a very short walk from the parking area, so I stayed warm in my car as long as possible before making a quick trip to the port-a-potties. There were plenty of them and they even had someone there directing people to open ones! So organized! There are no start corrals, but there are volunteers with pace signs held up for runners to organize themselves. Be ready though because as the race gets ready to go, everyone moves up. It could be difficult to get where you need to be if you arrive just in time. After the national anthem, it's pretty much "ready set go" and then everyone starts running! You run down the main street in town for a little bit and then start running out of town into beautiful country and farm land. This course is incredibly tough; there are hills and banks to the streets that make it hard on the legs of even the healthiest runners. The largest and most notorious is the dreaded Whiskey Hill, that pops up starting at mile 3.5, but then gets serious closer to the 4 mile mark. Living in Tennessee, I run hills all the time, but let me tell you, it's a doozie. In general, the first half of this course is much more challenging than the back half (thank goodness). The most beautiful views of rolling hills, farmland, countryside, come in the middle section. You also get quite a bit of farm life - lots of cows, horses, goats, chickens, even wild turkey. It definitely helps keep your mind distracted! The last few miles running back into town are super easy: straight and flat (maybe even a little decline in there). I will say that there are not a ton of aid stations, so I was really happy that I brought hydration/fuel with me. The finish line area is back in the center of town, in the middle of all of these super cute shops and restaurants. I cannot say enough about this finish experience because this race majorly spoils their runners. It's loaded with volunteers and refreshments, but beer drinkers take note that this is in a dry county, so don't expect any post race adult beverages. You do get lots of drink options and southern treats, among them brisket, grilled cheese sandwiches, and pimento cheese sandwiches. This is also where you line up to get your finisher's hat/visor and Swiftwick socks (told you, spoiled). There's live music, race merchandise, and folks on hand to talk about the Jack Daniel's Distillery if you want to take a post-race tour (this is the only place you can drink in the county). You can also pick up your keys (if you did key check) and vote for your favorite aid station. And now I know what you're thinking - what about the medal. Oh this medal. It is SO COOL! Every year they have a different design, but they are always wooden medals on leather cords. They are absolutely unique and look great for some variety on your medal rack. This race has serious swag; definitely worth all of the hills! 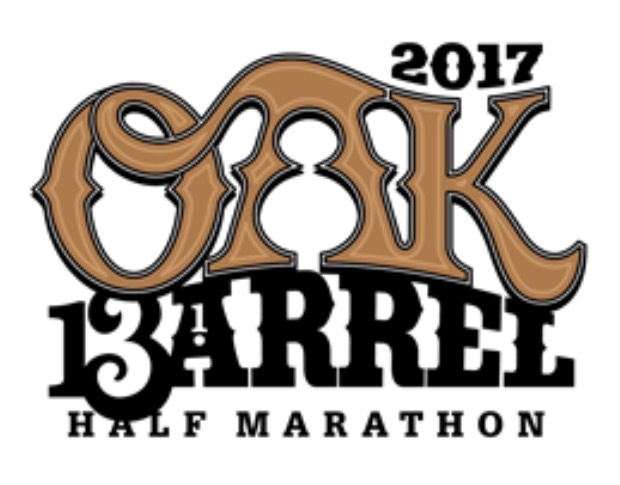 Run This Race If: You find yourself in Tennessee and love a great local race with great perks (and don't mind a challenge). Course: Loop course on rural, paved roads with lots of hills and banks. Do note that almost all the roads are open to cars. There are course directors at intersections, but you have to keep your eyes open for yourself and your fellow runners. What Makes It Unique: It has a great local feel coupled with fantastic sponsorship from Jack Daniel's. This race takes great care of its runners, so you can see why people come back year after year. Cost: Great Value. I'll warn you that this one sells out fast - this year sold out in 1 hour 45 minutes. You get a LOT for the $70 registration fee (and there are also charity spots available if you miss out on regular registration). Date And Time: Always on a Saturday in early April - 8 AM start. Would I Do It Again: I absolutely would. This one is worth the difficulty level. With a little registration luck, I'll toe the line again in 2018.